History never repeats, but sometimes it rhymes. The trigger for our last recession and financial crisis was an excessively leveraged US housing sector. Other factors contributed, but home mortgages and housing speculation were at the core. So it’s easy to assume that the next crisis, whenever it comes and whatever causes it, won’t be about housing. That may not be right, though. While US homeowners and lenders learned some hard lessons in the last crisis, and while I don’t see that kind of exuberance this time around in the US, I do see signs of it elsewhere. Canada is the most obvious case, but also Australia and parts of Asia and Europe. Imagine this: Rising interest rates and reduced foreign capital flows combine to push housing prices down in places like Vancouver. Leveraged players who own speculative homes start to liquidate their properties, pushing prices down further. Banks find themselves holding properties they neither need nor want. The dominoes begin to topple. So we might have another housing-driven crisis, but starting elsewhere. It would still affect the US, but differently from last time. 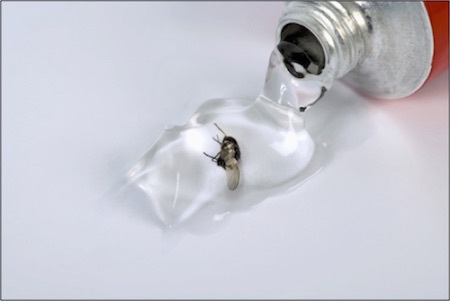 Our healing ointment could turn out to have a fly in it. The housing sector has two characteristics that lead to these problems. First, it’s highly leveraged. In the US it’s common for people to buy houses with only 5% or 10% of the purchase price in cash, leaving the buyer instantly leveraged 10X or 20X. That’s asking for trouble even if the sale price is fair, and it’s often not. Price is the other rub. Houses are illiquid because transactions occur infrequently and each property is unique. They aren’t like shares of stock. You can look at tax valuations and appraisals, but those are estimates. You can’t really know a house’s value until you try to sell it. Flying blind at 20X leverage is not the ideal way to learn about investing, but that’s how many Americans do it. 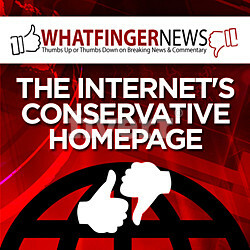 We’ve even convinced some of our closest neighbors and allies to adopt our ways. 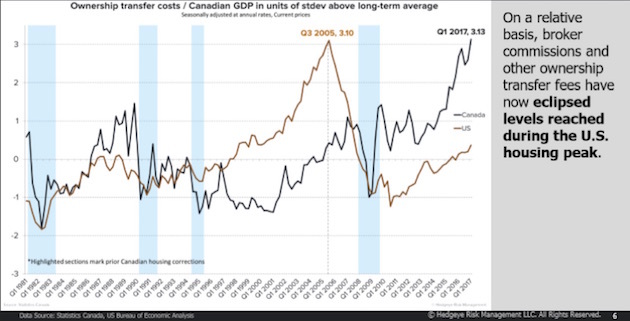 Last week Josh Steiner of Hedgeye kindly sent me a slide deck he assembled on housing in Canada, Australia, and the US. It was a revelation. Consider the following chart. Note the sidebar: On a relative basis, broker commissions and other ownership transfer fees have now eclipsed levels reached during the US housing peak. Those fees are now 3% of Canadian GDP! Really? How is that producing anything other than income for brokers? The two lines represent real estate transaction costs in the US (brown) and Canada (black), as a percentage of GDP. We see that the costs peaked in the US in late 2005, then fell rapidly the next couple of years as the economy tumbled into recession. Canada was less exuberant at the time; but, post-recession, housing in Canada climbed far faster than it in the US. By early 2017, Canadian homebuyers and sellers were spending as much on housing, relative to their economy’s size, as the US did at its 2005 peak. Meanwhile you have the Bank of Canada raising rates, slowly but surely. This seems like an ominous combo. Now, you could argue that Canada has something the US didn’t: cash-bearing Chinese buyers. Those buyers might make higher interest rates less harmful to home prices. True enough, but other things could discourage prices. We’ll come back to that later. The situation in Australia is even crazier, at least as Josh describes it. He works with an indicator that never occurred to me: crane count. The number of cranes operating in a city and the kinds of properties they are being used to build turns out to be a pretty good measure of housing activity. The chart below shows the crane count for Australia’s four largest cities. 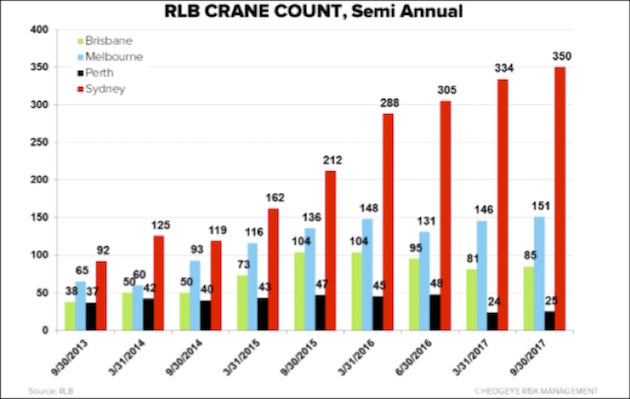 As of three months ago, Sydney alone had 350 cranes being used to build high-rise residential properties. That’s more cranes than were deployed in all of North America’s twelve largest cities. Construction is booming in Australia. In fact, the comparison is even more stark. On a per capita basis, Australia has 14.6 times as many residential construction cranes working as North America does. It gets crazier still. Australians engage in “negative gearing.” For tax reasons, people intentionally buy investment property that produces losses. We do that in the US, too, but we have ways to keep cash flow positive even as properties produce tax losses. In Australia, investors get interest-only loans to buy properties, then rent them for less than the loan payments and absorb the difference. They think they will make it up by selling at a profit. Negative gearing is (and should be) a truly bizarre concept to an investor, but it makes perfect sense to most Australians because home prices have only gone up for the last 25 years. There is a pervasive and genuine belief that they can’t lose. If this is right (and I’m sure my Australian readers will tell me), it will likely end in disaster. But actually, I get why younger Aussies might think this way. Those under 40 have never seen a recession in their adult lives. They have seen a resource-driven boom as Australia exported staggering quantities of raw materials to China. That incoming cash kept the country afloat even as others sank. It’s easy to think that condition is normal if you’ve never known anything else. Like what you’re reading? Subscribe now and receive the full version of John Mauldin’s Thoughts from the Frontline delivered to your inbox each week.